We’re forever appreciative of magazines that create original and visually-stimulating content time after time. WSJ has cemented itself as an innovator, its covers and features being a regular topic of discussion on our forums. 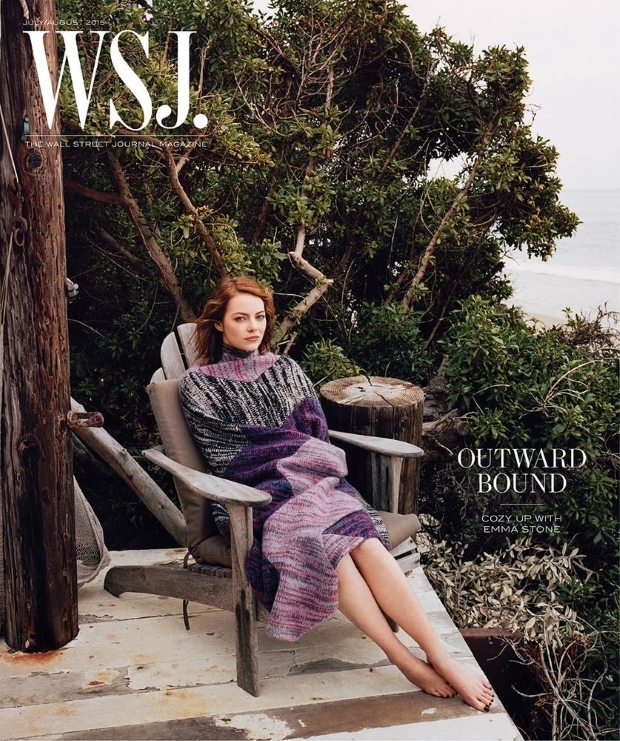 The magazine’s July/August cover star Emma Stone practically gets a make-under on location in Malibu as she snuggles up outdoors with a turtleneck sweater and a blanket before Angelo Pennetta‘s lens, styled by Francesca Burns. As usual, forum members couldn’t wait to see what WSJ had for us this time around. “I feel like making the mistake of watching Aloha just accelerated the process of finding her one of the most obnoxious actresses right now. Nice haircut and kudos to her colorist, but that’s about it,” shared an underwhelmed MulletProof. “This magazine resorts to 2 types of styling: earthy hippie/strong California vibe and minimal/throw on a cozy sweater. It’s getting tiresome,” expressed HeatherAnne. Mixed feelings seemed to be the overall theme in the thread. “The cover is very pretty, but the editorial looks like a story from Teen Vogue,” compared burbuja8910 the moment Emma’s cover story surfaced. “I like the cover but the ed falls flat,” agreed Cosmic Voices. Make your mind up about Emma’s pictures once you’ve taken a peek inside our thread here. Don’t forget to drop us a comment!